VMware vCenter Server's new Linked Mode capability allows administrators to manage complex vSphere virtual environments. administrators to move beyond vSphere's established limits in terms of implementation and management. A single vCenter server, for example, can support a maximum of 3,000 powered-on virtual machines (VMs) with a 64-bit vCenter Server OS. In Linked Mode environments, however, that jumps to 10,000 VMs. In this SearchVMware.com tip, I will configure Linked Mode and outline what's possible with this new vCenter capability. To put it simply: Linked Mode is a consolidated view of management zones. During the VMware Infrastructure 3 era, a connection with the VI Client to each vCenter server was required. For organizations with two vCenter servers, this is a tolerated practice. When three or more servers come into play, however, it quickly becomes annoying for the virtualization administrator to frequently transition between VI Client sessions for basic management tasks. Linked Mode is available in the VMware vSphere 4 Essentials Edition and higher and utilizes Windows Active Directory for communication between management zones. For environments with a single Active Directory domain, this process is fairly straightforward. But when domain trusts come into the picture, it becomes a little more complicated. To establish a vCenter Server Linked Mode connection, the base requirement is that the vCenter Server administrator account used must be able to authenticate in both domains. VMware has more details about vCenter Linked Mode and domain trusts available on the VMware Infrastructure Operations website. Domain name server must be operational for Linked Mode replication to work. If the domains have a two-way trust relationship the vCenter Server instances in a Linked Mode group can be in different domains. Each domain must trust the other domains on which vCenter Server instances are installed. 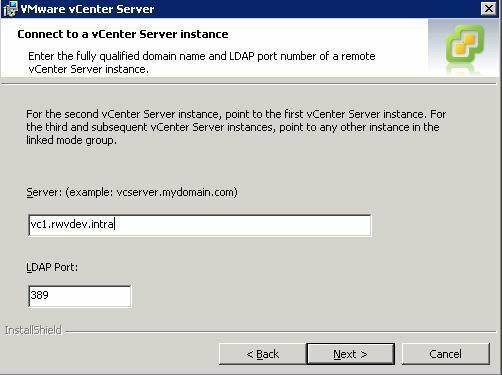 When adding a vCenter Server instance to a Linked Mode group, a domain user who is an administrator must run the installer on (1) the machine where vCenter Server is installed and (2) the target machine of the Linked Mode group. All vCenter Server instances must have network time synchronization. The vCenter Server installer validates that the machine clocks no more than five minutes apart. Once these conditions are verified, the vCenter server is now a candidate for Linked Mode. During a new installation, there's an option to install a new vCenter Server with Linked Mode, as seen in Figure 1. The installation process will then prompt you to add the existing vCenter server to configure for the new installation. In my example, VC1.RWVDEV.INTRA is the existing vCenter server and VC2.RWVDEV.INTRA is the second vCenter server, which is being installed with the Linked Mode configuration. The installation process provides the first vCenter Server information, which is shown in Figure 2. The installation will continue with the normal options, such as TCP ports for vCenter operation. Once the installation completes, the Linked Mode configuration will then run for the new vCenter server. The installation example above was on VC2.RWVDEV.INTRA. Once the installation is complete, the first view into the vSphere Client shows the existing vCenter configuration -- VC1.RWVDEV.INTRA -- when connecting to VC2.RWVDEV.INTRA. This is shown in Figure 3. 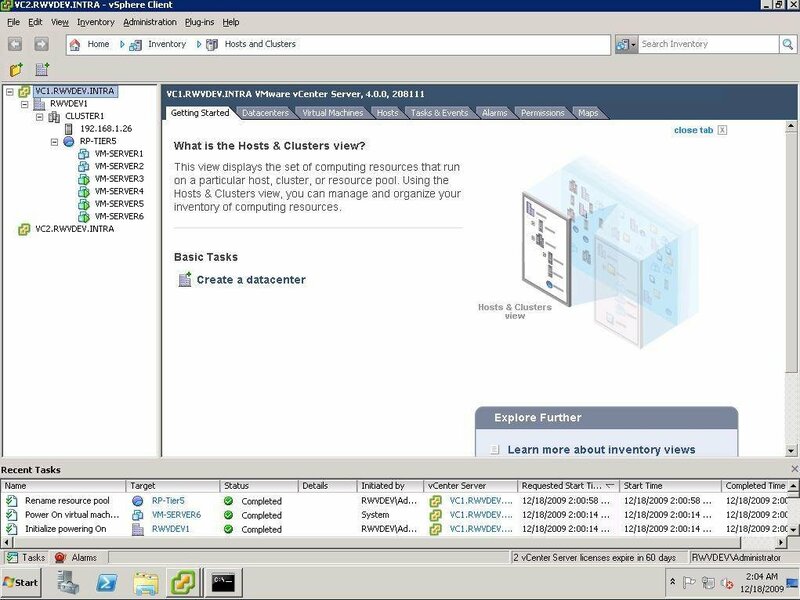 On the first vCenter Server, VC1.RWVDEV.INTRA, the Linked Mode configuration is displayed on subsequent connections to the vSphere Client. The vCenter activities, which are displayed in the scrolling log at the bottom of the screen, will now display both vCenter server's activities, as shown in Figure 4. Linked Mode doesn't allow for a fully connected virtual infrastructure or administrators to migrate VMs from a host managed on one vCenter server to another. This setup requires VMotion or offline migration technologies, such as cloning. You can circumvent some of these limitations with storage that is zoned to hosts in both management zones and removing a VM from the inventory of one vCenter server and then importing it into the inventory on the next vCenter server. One popular practice is to separate virtualization environments by their workload classification or security zones. While Linked Mode cannot move VMs between different management zones, the virtualization administrator can view the separated environments through a single management pane. Aside from the scrolling log benefit, additional Linked Mode benefits include the ability to create roles that can be used in each vCenter server. As highlighted in Figure 5, the roles are automatically replicated on every VMware vCenter server. You can, however, force the replication to occur on demand. On the vCenter server that does not show the custom role that you have created, you can restart the VMwareVCMSDS service. This service coordinates the Linked Mode features and can be restarted without affecting the running vSphere workloads. VMs, hosts, Distributed Resource Scheduler rules, High Availability and other core vSphere functions are not managed by this service. Centralized roles may be the best feature of vCenter Server Linked Mode. Managing roles and their associated group or user membership across multiple vCenter servers is a tedious process. Linked Mode reduces the risk of inconsistent configuration as well as of overassigning permissions in different environments. In my view, this is the biggest Linked Mode implantation issue. As previously stated, solutions to this problem include renaming custom roles with the vCenter Server name to identify the "owner" or consolidate the inventory of roles to a common configuration. With vSphere, using vCenter Server Linked Mode allows administrators to centrally manage virtual environments. This is a welcome configuration, and as shown in the steps above -- quite easy to implement in a VMware vCenter Server installation.